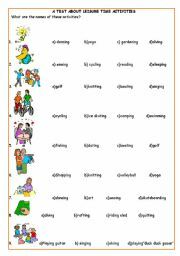 I think , it is very useful for your class. It contains "how often...." structure and its answers. Also , instructures are here. I know, you and your students will like it. I am happy because of meeting you again. This is second part of my work. 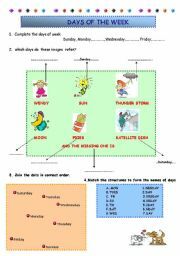 It includes a mini test about days and also some pictures for matching. This workheet is releated to birthday vocabulary.Also, it includes a birthday card. I think your students like this. 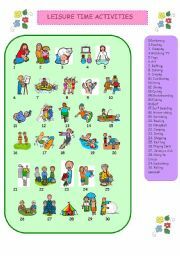 This is releated to leisure time activities.It includes 3 pages. 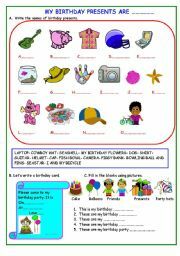 The aim is to teach the name of leisure time activities.I think your students will like this colourful worksheet. 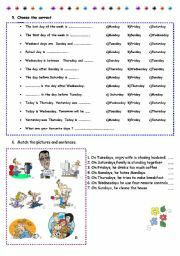 This worksheet includes 2 pages but I can�t send it like this.So, I have to divide it two parts.I hope, you and your students like it.Part 1 is about vocabulary and part 2 includes a mini test about days. 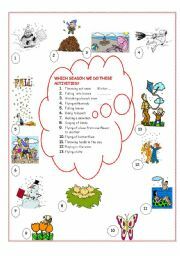 this worksheet about seasons. First, your students read the sentences and they decide the seasons. Then ,they write the season.I hope you like it. 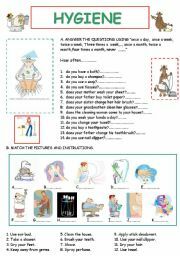 This test is about animals.It was divided 3 parts as a Animals test-1,Animals test-2,Animals test-3. 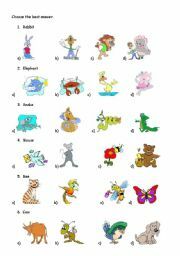 I think it is useful for teaching animal names.